This information was researched and crosschecked as best one can do given the ancient time frames.The reference to historical events is to better understand the circumstances that precipitated the family name de Mitton and Ralph the Red’s legacy to Mitton family descendants. It also reveals an overlooked Clitheroe post Norman history in which the de Mittons were a founding family. The families descendants played an important role in the local history for centuries. It made for an interesting story to research and hopefully to the reader as well. 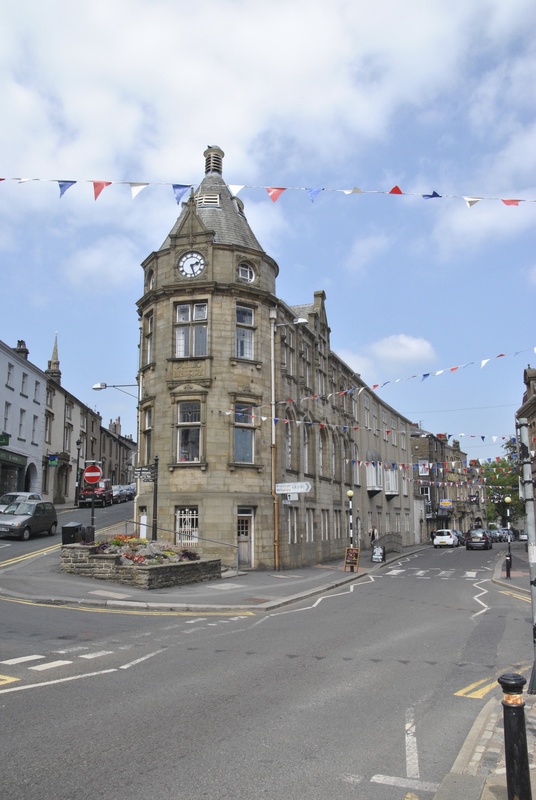 Clitheroe Library above; funded by Andrew Carnegie and where the author did research. Although there is certainty about the de Mitton pedigree from 1102 until 1377 from documentation in the “Coucher Book of Whalley”, there is a paternal line gap between 1377 and 1538 of de Mitton father to son identifications.There are lots of de Mittons recorded in this very limited geographic (25 sq. mile) area, just no specific genealogy record of who is whose father. However, nothing to suggest the Mittons identified around Clitheroe in the Court Rolls or the proximate Craven area locations during those years until the Bishops rolls beginning in 1538 are not of the same legacy bloodline of the Norman grantee Ralph the Red of present day Great Mitton. The Mittons of the Clitheroe – Craven area remained there for 700 years until their migrations to Canada and other places. They have been documented in these areas (if not diocese) of England for centuries (they must have liked the neighborhood). I have identified them as first the Norman de Mittons and then Craven Mittons during those centuries. There exists on a Mitton website an excellent family tree of various Mitton lines back to about 1723, the birth date of “Squire” Joseph Mitton. Joseph’s ancestry is the best axiom point to connect pedigrees of various descendant Canadian-US Mittons to their ancient “roots” progenitor ancestor Ralph the Red.That pedigree is substantiated by a primary document written by Edmund Mitton in 1906 that traces his Canadian ancestry to Joesph Mitton from the Craven area. From Squire Joseph Mitton 1723-92 I have an authentic father-to-father pedigree line back to the mid 1500s when the Bishops’ Rolls began recording births, marriages and deaths. It was Squire Mittons sons and grandsons (identified by Edmund Mitton) that emigrated to Canada in the 19th century and connect the North American descendants of the Mitton family to Great Mitton itself and Ralph the Red. The earliest de Mitton genealogy records come from the Coucher book of Whalley recorded by the early13th century abbots of Whalley Abby. This local Norman family genealogy’s from the mid-12th century until the late 14th century and has been relied on by many past researchers. Other research findings have the genealogies of the de Lacy`s (the de Mitton precursor family) back to the early 11th century in Normandy, two generations before the Conquest. If you run across a Mitton that can trace back their more recent ancestry to that of Squire Joseph Mitton (1723-93) buried at Horton in Ribblesdale, Lancashire, then you most likely share a common ancestor; Radulphus le Rous de Mitton. Bruce Floyd Mitton (1948- DOD still pending). For those interested, research can be found at the Mormon “Family Search”. That information includes genealogies as well as sources from other researchers confirming material I have found. The Mormons have various family research centers throughout the United States and under “Family Ancestry” on the web. The 1982 edition of Jack Knowles’ “The Mittons of Craven” was located at the British Library and is a meticulous researched genealogy. The earliest Mitton genealogy comes from the “Coucher Book of Whalley”. Many de Mittons are recorded in the “Clitheroe Court Rolls” of the 13th to 16th century. The Canadian – US lines from Joseph “Squire” Mitton 1723-1792 to the authors immediate contemporary family is from the 1906 primary document of Edmund Mitton of Ridgetown. Other research came from the Internet. “Web” reference is on file as to web sites where sources and information was found and are included when appropriate in this site. Please note most of the photos can be double clicked for enlargement.